Did you know there was a RoboCop animated series? Yeah, pretty crazy, right? Well, this figure isn’t from that. 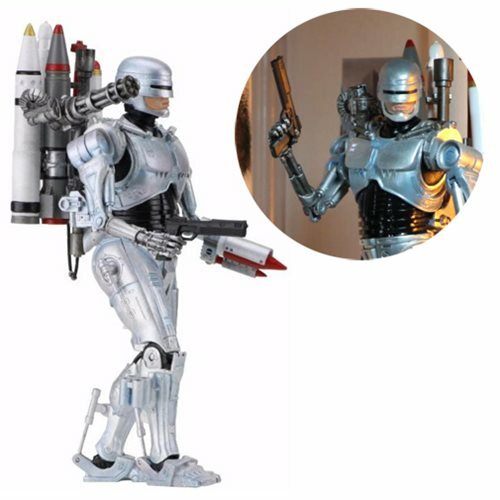 Rather, it’s based on the Ultimate Future RoboCop from the Frank Miller comic RoboCop vs. The Terminator. The figure is 7 inches, features over 25 points of articulation, and comes with his standard Auto 9 pistol as an accessory; y’know, along with all the missiles and the minigun. This entry was posted on Friday, September 29th, 2017 at 10:00	and is filed under Toys. You can follow any responses to this entry through the RSS 2.0 feed. Both comments and pings are currently closed.